Cyrano de Bergerac is a 1990 French comedy drama film directed by Jean-Paul Rappeneau and based on the 1897 play of the same name by Edmond Rostand, adapted by Jean-Claude Carrière and Rappeneau. It stars Gérard Depardieu, Anne Brochet and Vincent Pérez. The film was a co-production between companies in France and Hungary. Subtitles are used for the non-French market; the English language version use Anthony Burgess's translation of the text, which uses five-beat lines with a varying number of syllables and a regular couplet rhyming scheme, in other words, a sprung rhythm. Although he sustains the five-beat rhythm through most of the play, Burgess sometimes allows this structure to break deliberately: in Act V, he allows it collapse completely, creating a free verse. 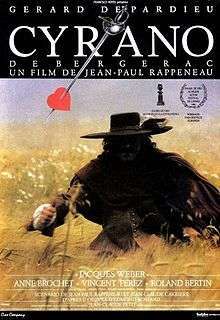 In 2010 Cyrano de Bergerac was ranked number 43 in Empire magazine's "The 100 Best Films Of World Cinema". Cyrano de Bergerac is a Parisian poet and swashbuckler with a large nose of which he is self-conscious, but pretends to be proud. He is madly in love with his "friendly cousin" (they were not actually related as cousins), the beautiful Roxane; however, he does not believe she will requite his love because he considers himself physically unattractive, because of his over large nose. Soon, he finds that Roxane has become infatuated with Christian de Neuvillette, a dashing new recruit to the Cadets de Gascogne, the military unit in which Cyrano is serving. Christian however, despite his good looks, is tongue-tied when speaking with women. Seeing an opportunity to vicariously declare his love for Roxane, he decides to aid Christian, who does not know how to court a woman and gain her love. ↑ JP. "Cyrano de Bergerac (1990)- JPBox-Office". Retrieved 28 October 2016. ↑ JP (28 March 1990). "Cyrano de Bergerac (1990)". JPBox-Office. ↑ "The 100 Best Films Of World Cinema – 43. Cyrano de Bergerac". Empire. ↑ "The 63rd Academy Awards (1991) Nominees and Winners". oscars.org. Retrieved 12 September 2015. ↑ "Festival de Cannes: Cyrano de Bergerac". festival-cannes.com. Retrieved 4 August 2009. ↑ "Umbrella Entertainment - Collection". Retrieved 28 May 2013. ↑ "Umbrella Entertainment - Academy Award Edition". Retrieved 28 May 2013.